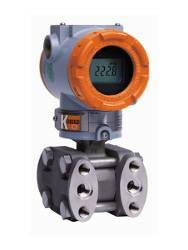 KOBOLD PAD Heavy Duty Differential Pressure Transmitter for measuring of pressure, flow and level. Customizable span from 0.3" W.C. to 6" W.C to 60 to 6000 PSIG. Stainless Steel, Hast-C, Tantalum or Monel material. 4500 PSIG max pressure. 4-20mA or frequency output. Differential, Gauge, or Absolute Pressure sensors. HART communication. IP 67. ATEX and FM approvals options. The KOBOLD Differential Pressure Transmitter model PAD is a microprocessor based high performance transmitter. It has flexible pressure calibration and output, automatic compensation of ambient temperature and process variables, configuration of various parameters, and communication with HART � protocol. It measures pressure, flow and level by an application method. All data is input, modified and stored in EEPROM. The Electronics module consists of a circuit board sealed in an enclosure. There is an MCU module. an analog module, an LCD module and a terminal module within the transmitter. The MCU module acquires the digital value from the analog module and applies correction coefficients selected from EEPROM. The output section of the MCU module converts the digital signal to a 4...20 mA output. 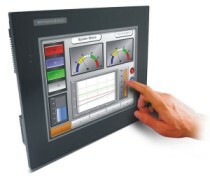 The MCU module communicates with the HART � -based configurator or control system such as DCS. The power section of the MCU module has a DC-to-DC power conversion circuit and an input/output isolation circuit. The LCD module plugs into the MCU module and displays the digital output in a user-configured unit. The models PAD-D, PAD-G, and PAD-H are available in a capacitance type differential pressure sensor. It measures differential and gauge pressure and is commonly used in flow and level applications. Both sides in the capacitance sensor transmit process pressure from the process isolators to the sensor. The model PAD-A is also available in a piezoresistive type absolute pressure sensor. The sensor module converts the capacitance or the resistance to the digital value. The MCU module calculates the process pressure based on the digital value. The software of the transmitter compensates thermal effects, improving performance. Precise Input Compensation during operation is achieved	with temperature and pressure correction coefficients that are characterized over the range of the transmitter and stored in the sensor module EEPROM memory. EEPROM stores sensor information and correction coeficients separately from MCU module, allowing for easy repair, reconfiguration and replacement. When the pressure transmitter should be vertically installed irrespective of the orientation of the process connection lines, modified fIanges (as shown above) are required in addition to the basic flanges. Multi- planar pressure transmitters have been made in an effort to solve the problems occurring in these types of installation. The object of this is to provide a pressure transmitter, capable of being vertically installed, without separate adaptors or various types of brackets. This is regardless of the position of the process connection lines. Zero and span values can be set anywhere within the range limits. Span must be greater than or equal to the minimum span. Output type: open collector, 30 V, 500 mA max. Pulse rate: 49 pulses/sec max.